SoundToys has announced the release of the SoundToys V4 bundle, offering two new plug-ins, a new built-in preset management system and an exclusive V4 set of presets. The new plug-ins are the much anticipated Decapitator analog saturation modeler and the PanMan rhythmic auto-panner. Existing customers can upgrade for $199 for SoundToys TDM Effects or $99 for SoundToys Native Effects. V4 upgrades for single plug-ins also available. New customers can purchase the bundle for $1195 (TDM) / $495 (Native). 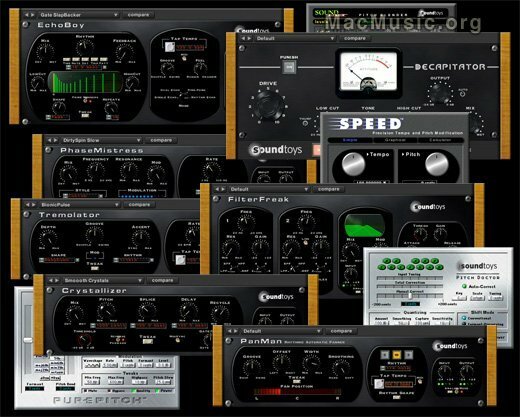 SoundToys is now offering individual plug-ins in native formats for $179 per plug-in, with support for RTAS, VST and Audio Units. For Pro Tools HD users, single TDM plug-ins are still available for $349 each.